This month marks one year of a brutal bombing campaign in Yemen, the poorest country in the Middle East. A Saudi-led coalition armed and supported by the U.S. and U.K. has pummeled Yemen relentlessly since late March 2015, bombing hospitals, homes, schools, weddings and more. Over the same time period, Saudi Arabia has also imposed a naval, land and air blockade on Yemen — which imported more than 90 percent of its staple foods when the conflict began. This blockade is even less discussed in the U.S. media than the already little-discussed war. For more than half a year, the United Nations has warned that, because of this Western-backed war and blockade, most Yemenis are suffering from a "humanitarian catastrophe." In late January, Salon reported on the mass starvation ongoing in Yemen. At the time, the U.N. Food and Agriculture Organization, or FAO, estimated that approximately 14.4 million Yemenis — more than half of the population — was food insecure. Almost two months later, the problem has not gotten any better. At least 14.4 million Yemenis, 55 percent of the population, still face hunger, according to the FAO's March 22 situation report on Yemen. The report also indicates that 21.2 million Yemenis, 82 percent of the population, are in need of humanitarian aid, a 33 percent increase since the start of the war. "Access constraints remain high and affected families lack vital supplies and services, including water, food and medical care," the FAO says. "Prior to the escalation in conflict, Yemen was already one of the world's poorest and most water scarce countries, with the second highest rate of chronic malnutrition among children," the report adds. Moreover, at least 2.5 million Yemenis, 10 percent of the population, have also been displaced, according to the U.N. In it January report, the U.N. called the humanitarian catastrophe in Yemen a "forgotten crisis, with millions of people in urgent need across the country." "The numbers are staggering," Etienne Peterschmitt, FAO deputy representative and emergency response team leader in Yemen, remarked at the time. It remains this way today, and nothing suggests the situation will get any better. "The conflict in Yemen has escalated dramatically since mid-March 2015, with dire consequences for civilians," the FAO writes in its March situation report. In December, the U.N. said Yemen was on the brink of famine. The World Food Program put food insecurity in almost half of the country at "emergency" levels, just a step below famine. There has been almost no acknowledgement of the ongoing U.S.-backed war in the American political system, and it has not been mentioned in any of the presidential debates. California Congressman Ted Lieu has been one of the only American politicians to raise concerns about U.S. support for the war. 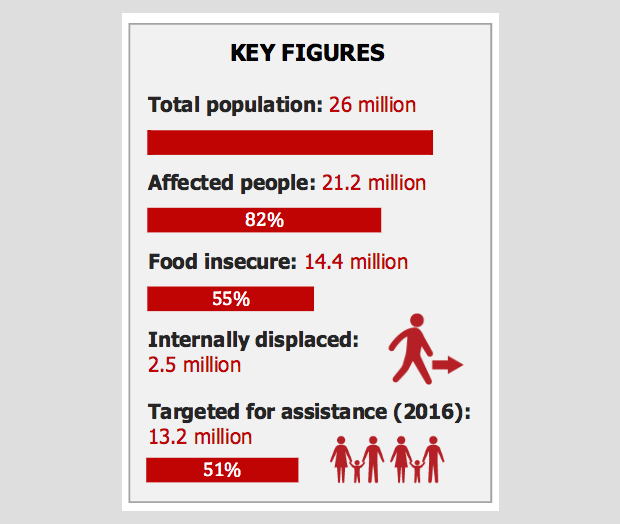 Since June 2015, humanitarian organizations have warned that 80 percent of the Yemeni population, 21 million people, have desperately needed food, water, medical supplies and fuel. Journalists, aid workers and human rights experts have repeatedly expressed concern about these enormous problems, again and again for months, but the international community and the Western governments backing the catastrophic Saudi-led war and blockade have done virtually nothing to stop the carnage.